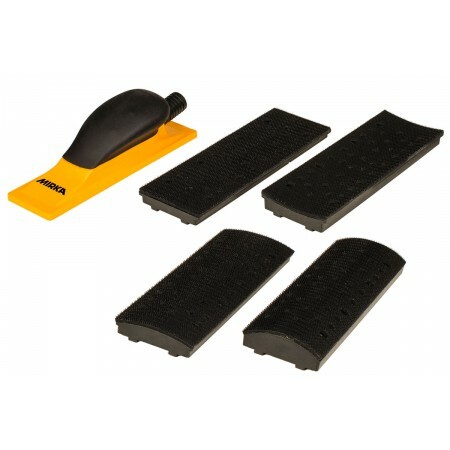 A multipurpose tool conceived for sanding on concave, convex and flat shaped surfaces thanks to special plates attached to a hand block body. The replacement of the different plates is quick and easy. This kit contains a hand block body 70 x 198 mm, a hose adapter ¯ 20/28 mm outer diameter and 4 changeable plates (Convex with R = 160 mm, Concave with R = 52 mm, Concave with R = 100 mm and Flat).